April 28, 1999, 8 p.m.
May 4, 1999, 8 p.m.
Hanne Darboven was born in Munich in 1941 and has lived for many years in Hamburg. Since the end of the 1960s, she has worked with numerical additions based on calendar dates, which she writes out in drawings and books and presents in wall- and spatial installations. 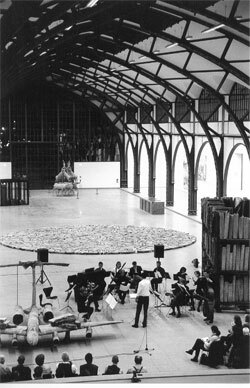 She began to translate the numerical constructions that underlie her visual works into musical structures in 1979. Darboven reconfigures certain calendrical numerals into tones and musical notations, some of which are later transcribed into instrumental parts and conventional musical scores by the musician Friedrich Stoppa. Of the musical works by Hanne Darboven presented in this program, »opus 19 & opus 20« is based on various computations of digital sums of this century – calculations using the dates 1.1.00 to 31.12.99. »opus 26« is based on the numerical constructions that result from taking apart the numbers 1 to 99. The performance of these selected pieces makes it possible to acoustically experience the various numerical systems written out by the artist in her visual artistic works. Presented here in excerpts, the works »opus 19 & opus 20« refer directly to her »Requiem« (1971–1985), which consists of some 45,000 pages in 61 x 2 books and contains quotes from both literature and from Johann Sebastian Bach's »Toccata et Fuga in D minor«. The inclusion of pieces composed over the years for harmonium or organ, for string quartet and for chamber orchestra offers insight into the full spectrum of Hanne Darboven's musical oeuvre. The concert in Berlin was made possible by Verein der Freunde der Nationalgalerie.